You know the thrill of pulling off something that’s been in your head for a long time? Like when you have a brilliant idea in the shower and you write it down later and don’t forget any of it and it still sounds like a great idea? That’s how I feel about this outfit. I bought all the pieces separately and had an idea in my head about how I would wear them together, and when I finally put the outfit on with the cherry on top–my roommate’s cool thrifted cateye sunglasses–I felt good. I was also thrilled that I was able to incorporate a lot of trends into one outfit that actually ended up looking, in my opinion, pretty classic. 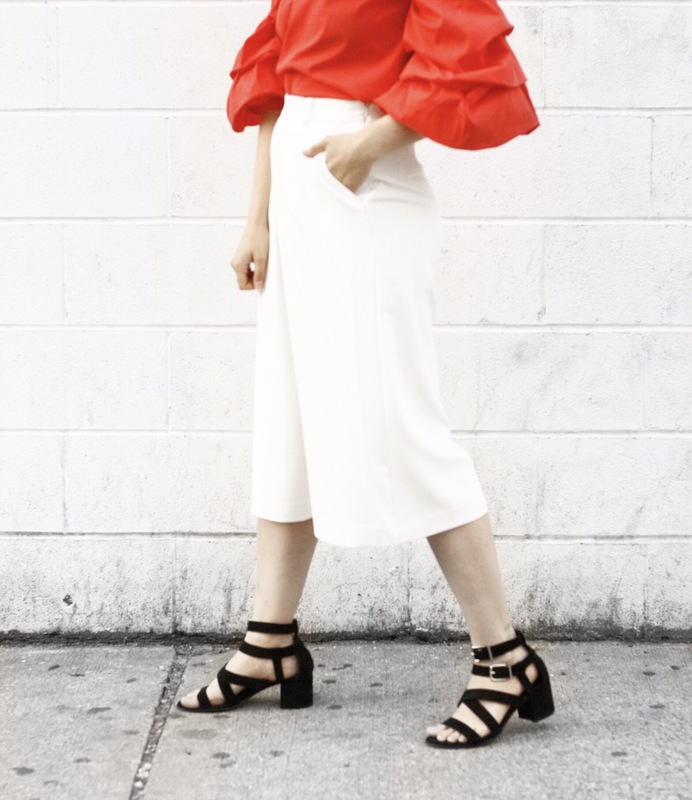 Off the shoulder, dramatic sleeves, big tassel earrings, and wide leg pants/culottes are all very trendy, but I didn’t feel like I was wearing a costume, even though this outfit is a lot more *loud* than anything I would usually wear. I felt very confident even though the outfit drew a lot of attention, which is something I normally try to avoid. 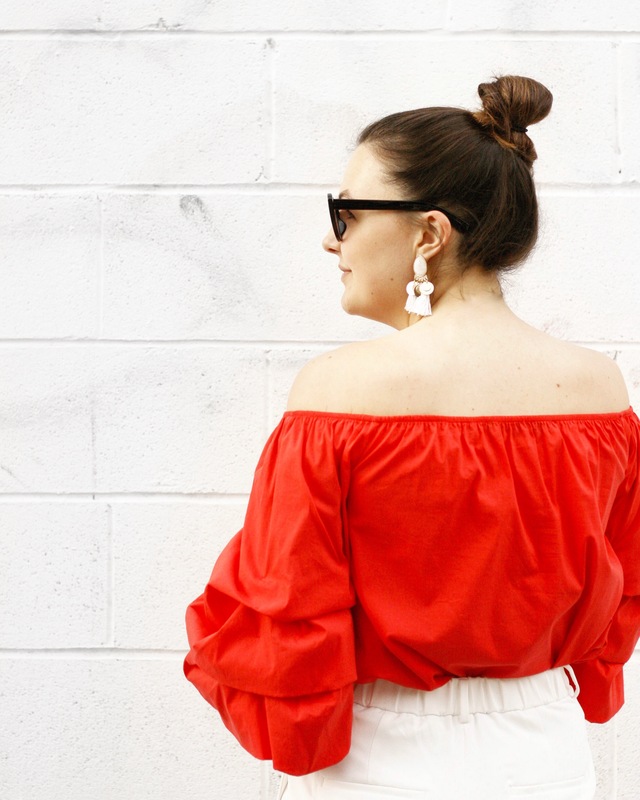 And can we talk about these puffy sleeves for a second? I don’t think I’ve ever owned anything with poofy sleeves like this before, and they were so fun and reminded me of Anne in Anne of Green Gables and her obsession with puffed sleeves. Then I read this article about my favorite (okay, everyone’s favorite) adaption of Anne and got incredibly sentimental and grew even more attached to the puffed sleeves. If you follow me on Instagram you might have seen that I got accepted to Reward Style/LIKEtoKNOW.it and several friends have asked me what that means. If you don’t know, Like to Know It is an app you can download and connect with your Instagram account. When you screenshot a picture on Instagram that is enabled (you’ll know by the link and hashtags in the caption) you can shop that outfit directly through the LIKEtoKNOW.it app. You can also shop this outfit specifically directly through this link. And full disclosure–if you buy anything I link through the app, I earn commission. 🙂 If you have any more questions, please ask away.